"The main driver for offsite construction for this project was speed – and to see a building of this scale constructed so quickly was amazing. The McAvoy construction team was fantastic and demonstrated a high level of skill and flexibility." Lynch Hill Enterprise Academy is one of the largest ever modular schools to be built in the UK. It demonstrates a number of new innovations which contributed to its early completion – an unprecedented 17 weeks ahead of programme, giving this new free school the benefit of even earlier occupation. 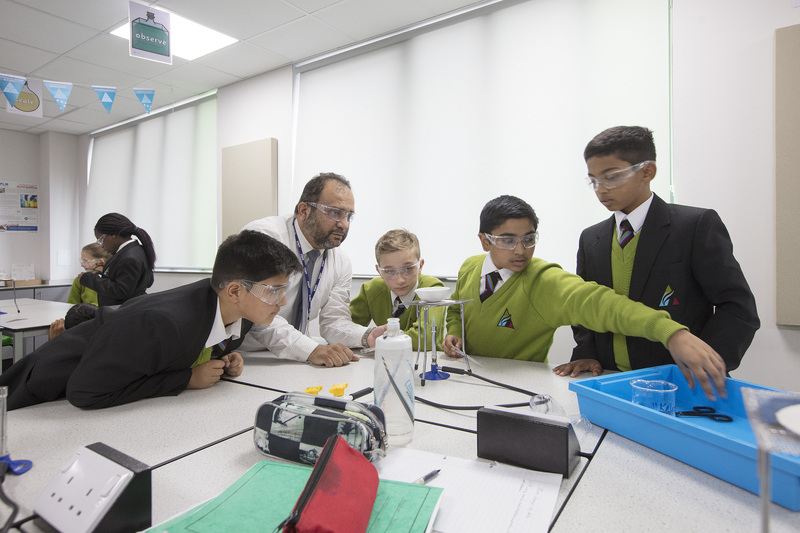 This 1,140-place academy specialises in science, technology, engineering and maths, and was built by The McAvoy Group as principal contractor for the Learning Alliance Academy Trust. Funded by the Education and Skills Funding Agency (ESFA), this three-storey building is an exemplar offsite education project which has a design inspired by the world-leading Harvard Business School. The design brief set out a number of important criteria, all required within the ESFA’s available budget, which the project successfully met. It had to facilitate the exchange of knowledge with business and encourage a sense of enterprise among students, thereby helping to bridge the skills gap for local companies. It had to create an environment for collaborative learning and mentoring, and provide good visibility as part of the school’s anti-bullying strategy. It had to have excellent acoustic performance. Community access was required to the sports facilities. The school is designed around four large multi-functional central spaces which help to maximise natural light and encourage interaction and collaborative learning. The use of inspirational messages and bold colours throughout reflects the academy’s ethos of enterprise, aspiration and achievement. The building features an impressive full-height glazed entrance, a striking timber colonnade with brise soleil sunshading, and a palette of materials which includes render and timber-effect rainscreen cladding to harmonise the scheme in its semi-rural location. Lynch Hill demonstrates a number of technical advancements in offsite construction. Larger 15.6m long modules and a new lifting system were specially engineered by McAvoy for the project which reduced time, transport and installation costs and further improved construction efficiency. Some of the steel-framed modules were pre-clad offsite in the factory to further reduce time on site. The use of a McAvoy offsite solution for the curriculum areas also removed the need for storage of large volumes of building materials on the site, helping to address the issue of restricted access. Around 65 per cent of the building’s construction was completed offsite. 146 modules were installed with doors, windows, ironmongery, internal walls, plumbing, electrics and joinery already in place. This approach reduced the build programme to just 53 weeks. The design for Lynch Hill was initially developed for another site and then had to be adapted for a second and final brownfield site. The build programme had to accommodate extensive demolition works, asbestos removal, the adjacent construction of a new sports stadium, restricted access, and the school’s first intake of pupils who were located in temporary buildings also on the site. Construction had to be phased to allow early handover of the sports hall and changing facilities for use by the school. The build programme was around six months less compared to site-based construction for a school of this scale. An enterprise exchange runs through the core of the building on two levels to facilitate collaboration with local businesses. There is a four-court sports hall and a main hall with retractable seating which were constructed using a fast-track steel system. The sports hall can be separated and secured from the rest of the school out of hours. Externally there is a landscaped area and social space which form a large arrival plaza at the front of the school. This creates a sense of place and identity for the academy and encourages informal gatherings with its planting and seating. There are outdoor teaching spaces, a soft landscaped study garden, social area, multi-use games areas, and a sports pitch. BIM was valuable for the Lynch Hill project, allowing design plans to be reviewed for clash detection of services with the modular structure. This helped to ensure seamless construction and removed the need for additional site works. "The combination of steel-framed construction and the offsite solution works really well and is seamless. You would never know this was a modular build. This is an outstanding secondary school scheme." "This new academy has been developed to address a severe shortfall in school places in Slough. The facilities are terrific and the children are enjoying a fantastic new learning environment and the benefits of cutting edge design. The building works very well to optimise the space, to provide excellent acoustic performance and high levels of natural light, and to future-proof the needs of the children." "The speed of offsite construction was the biggest benefit of the approach on this project. To build a school of this scale over two floors and using a state-of-the-art design within a year is amazing. The solution has worked very well for Lynch Hill and we have had such positive feedback from both parents and staff." "McAvoy worked extremely hard to deliver the building and we had a very positive relationship with the project team throughout. We would recommend the design and the process to any head or trust looking for a building solution that delivers both speed and this quality of learning environment."